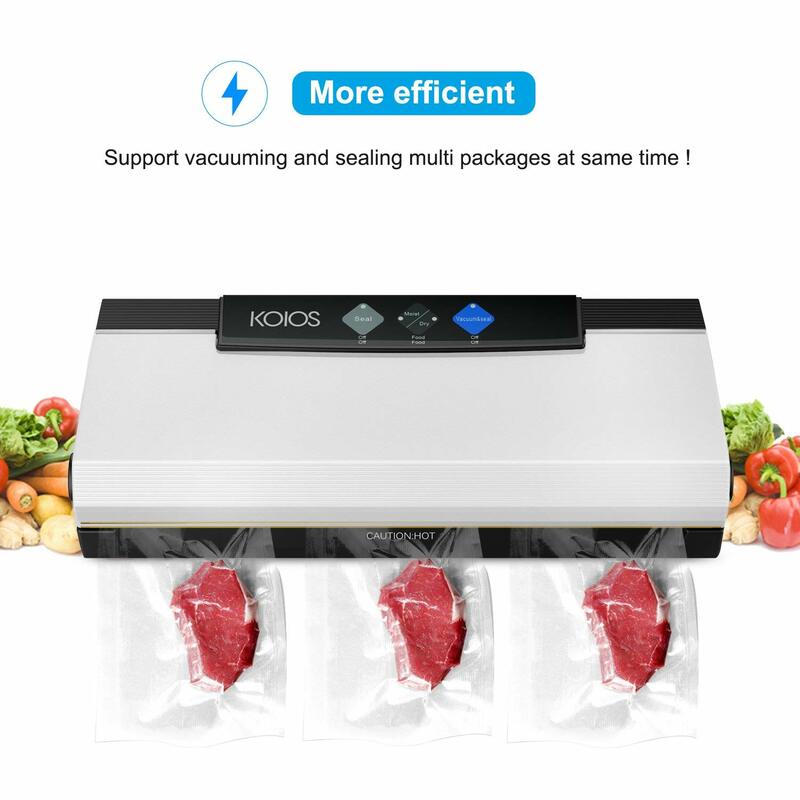 4-IN-1 MULTI-FUNCTION SEALER: The Koios vacuum sealing machine features dry & moist food vacuum sealing, seal only, vacuum & seal and cutter. 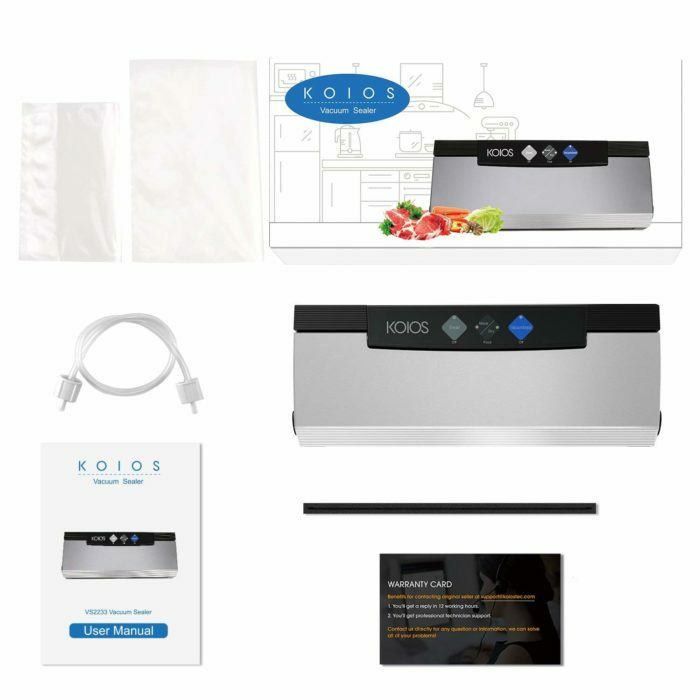 The package comes with a tube also, meaning you can not only vacuum and seal food but also vacuum pack red wine and other liquids, as well as paper files, clothing and Jewelry. 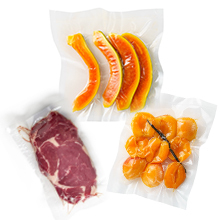 ENJOY A PERFECT & HEALTHY TASTE: Removing air from the sealer bags can keep your food fresher for longer. 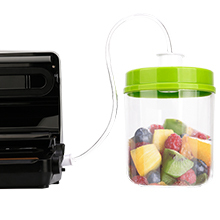 It’s an ideal food saver for vegetables, meat, fruits and marinated food etc. Keep food free from nasty bugs and bacteria. In the Meantime, the vacuum sealed ingredients are ready for sous-vide cooking, locking in all the flavors and the nutrition. Treat you, your friends and family to great-tasting fresh food. EASY OPERATION: Touch panel buttons control every function easily. Press the three function buttons to vacuum and seal your food automatically; you can use the cutter to cut the bag according to the food you want to package. The machine can also vacuum and seal multiple bags at the same time which is more efficient in helping you pack food. 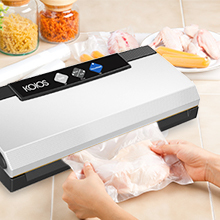 COMPACT DESIGN BUT POWERFUL: The vacuum sealer can work continuously up to 30 times; after vacuuming and sealing, the food can be kept fresh for much longer. It also can be used for other household items like storage, which can prevent dust and mold forming, as well as saving space in your kitchen and rooms. 12-MONTH WARRANTY AND FURTHER SERVICE: We take full responsibility for product quality and offer a 1-year warranty with 100% satisfaction. Customer service and technical support are available 24 hours if you need assistance. Keep your busy kitchen running smoothly . 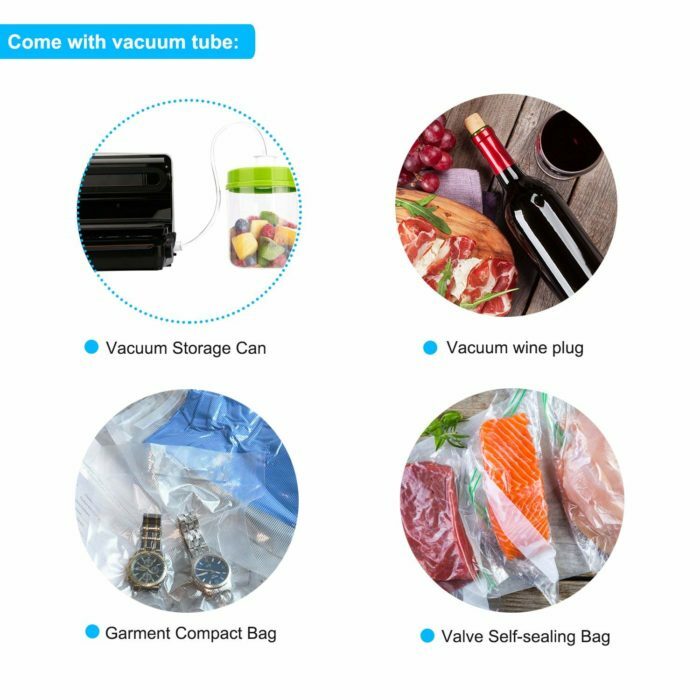 Preserve food and wine with vacuum sealing. Cook food in advance then vacuum seal individual portions or entire meals for later consumption. A Much Needed Assistant for Sous-vide cooking. Maintain the freshness of dry foods such as beans, nuts, and cereals. Package foods such as meat, fish, poultry, seafood and vegetables for refrigerated storage. Prepare foods in advance for picnics, camping trips and barbecues. mply use the ‘Dry’ or ‘Moist’ feature if you’re sealing dry foods or with moisture. And it will reduce the oxygen on the airtight bag or pull any added moisture. 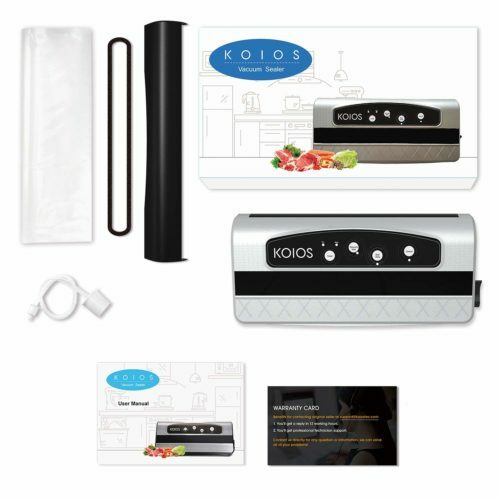 Prolong the freshness and shelf life of your food with KOIOS’s Vacuum Sealer. Cooking food sous vide ensures your food is evenly cooked without all of the mess and guess work that goes into grilling or pan frying. It kept its original apperance, did not lose excess amounts of fat, and had better texture. To ensure your food is safe from bacteria you must clean it periodically. 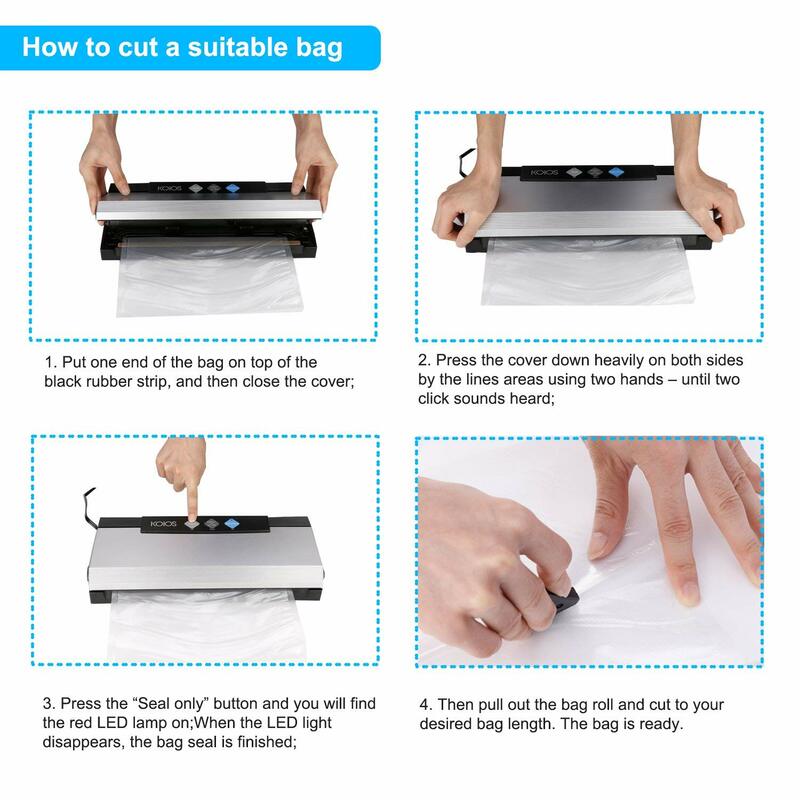 It is recommended that you clean your vacuum sealer after use because bacteria can build up easily. With proper care, it will provide you a long time of service. Question: What is the sponge thing (kind of double that is hooked on each end) that came in the box? I see nothing in the user manual regarding it. Thanks! Question: is there a better user manual? I don’t know how to use the tube thing….. Question: how to prevent water seal? Question: what is the tube for and how do you use it? Answer: Plastic tube is used on special containers designed for vacuum sealers. Question: Ok, how does oneuse the little tube that little tube gizmo that comes with? It plugs in where? This vacuum sealer does as expected seems like a much nicer quality than the vacuum sealer I had in the past. It’s so nice, that my brother talked me into letting him have it to vacuum seal his fish, deer, dove?…basically whatever he brings back from his fishing/hunting trips 😐 Seems like it’d be put to good use so I couldn’t argue 🙂 Thanks! Absolutely one of the best sealers I’ve used and rally nice and compact. I purchased this for freezing rather than canning corn this year. Anxious to try it. Unfortunately corn is late this year. Works great for freezing meat bought in bulk. Saves money and time. I’ve had a seal a meal for many years, but it stopped working properly. I was hesitant to buy a different brand, but like this very much. The bags I had left seem to work with new machine too. Great product overall. It does what it is supposed to do, which is seal bags. Works especially well with meat and moist items. I took off one start because the instructions are confusing and not exactly right. Wish it came with more bags as well. VENDOR OFFERED FULL REPLACEMENT OR REFUND. If you buy one of these and it just happens to go bad, I have no doubt that the vendor will take care of you. Vendor should probably get 5 stars. [original review, 1-star] Worked really well for a few months. Now refuses to pull the air out. I bought 2 of this item. I was upset at first because they worked improperly. However, the customer service agent contacted, confirmed the issue, got me the refund and an upgrade vacuum sealer machine: https://www.amazon.com/dp/B07FM2CQXJ . The upgrade item works perfectly. It seals the bag tight and stops automatically once everything is done. 5 stars for the great customer service and the upgrade version ! Very easy to use and very nice for the need. Have not used it long so will update later on the durability and longevity. Love it should have bought one years ago. Original unit didn’t vacuum properly. The company happily replaced the unit. Great customer service. New unit works well. First, the manual is nearly useless but once you figure it out on your own or go to YouTube it works great. Vacuum sealer worked well. I use it to prepare food for my Anova Sous Vide (water bath cooking). The resultant sealed bag was very robust. Be careful about how you put the bag in. Sealer is good. I don’t have a dislike!!!! I Can’t Stop Using It….. Satisfied!!!!! For years I had a “Seal a Meal” which I loved, but finally died. This is the closest vacuum sealer I could find that matched the quality. Also smaller for better storage. The only thing is this device take about 2-4 minutes to vacuum, but everything else is very handy to use. 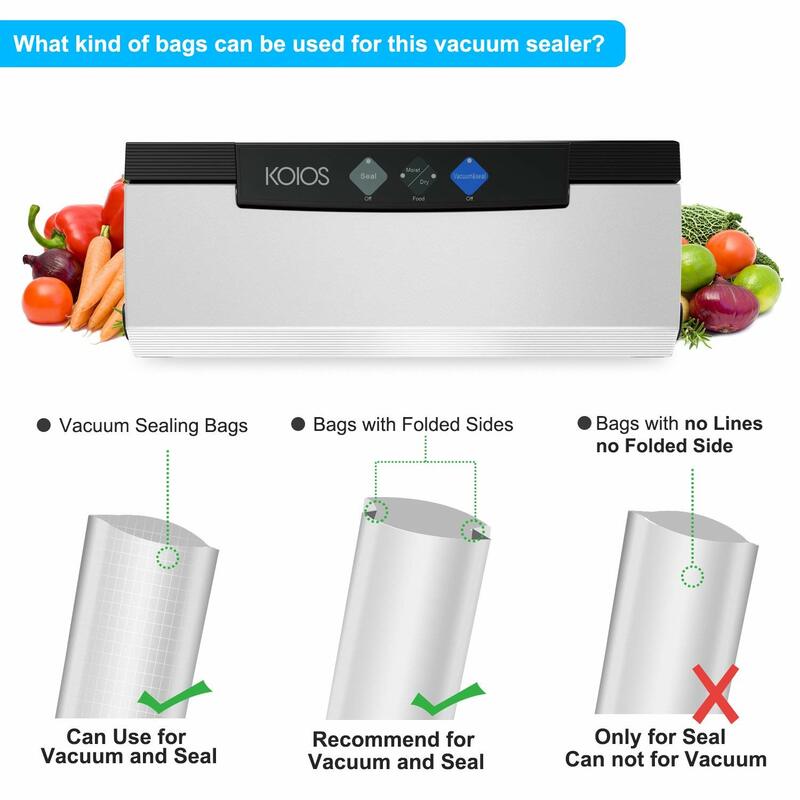 It is effortless to vacuum seal my food product well. Last week the whole family went out to play, using the machine to pack the fruit and some cooked food, the food was easy to carry and not easy to break, very convenient. Give a thumbs up! I’ve used it a few dozen times at this point. In the past I’ve only ever owed the name brands. This works just as well. I’m very happy with it this far. 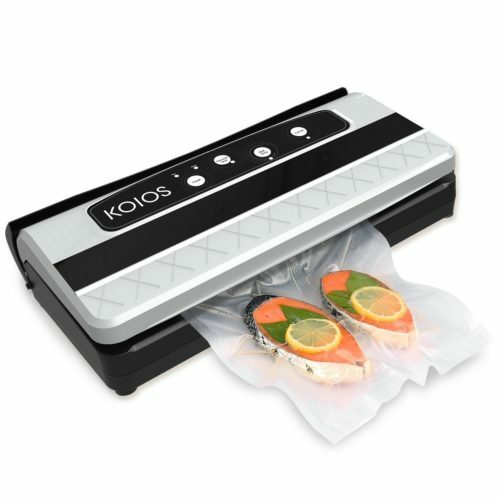 I use this vacuum sealer to seal my package film wraps. It seals it pretty strong. Also it heats up fast. With vacuum feature, it is supposed I can use it to seal food bags too. 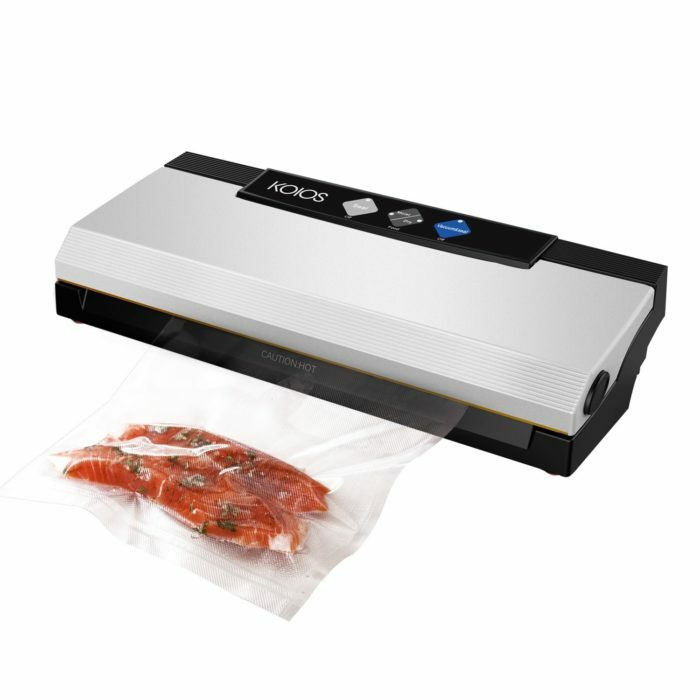 The vacuum sealer looks sleek and is easy to operate. It’s wide enough to accommodate large bags. 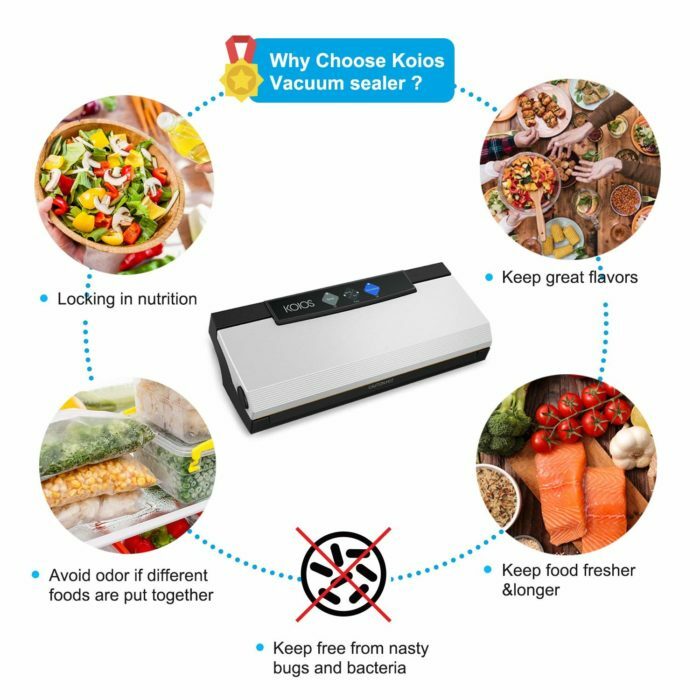 It has three buttons: seal only, dry/moist selection, and vacuum seal. 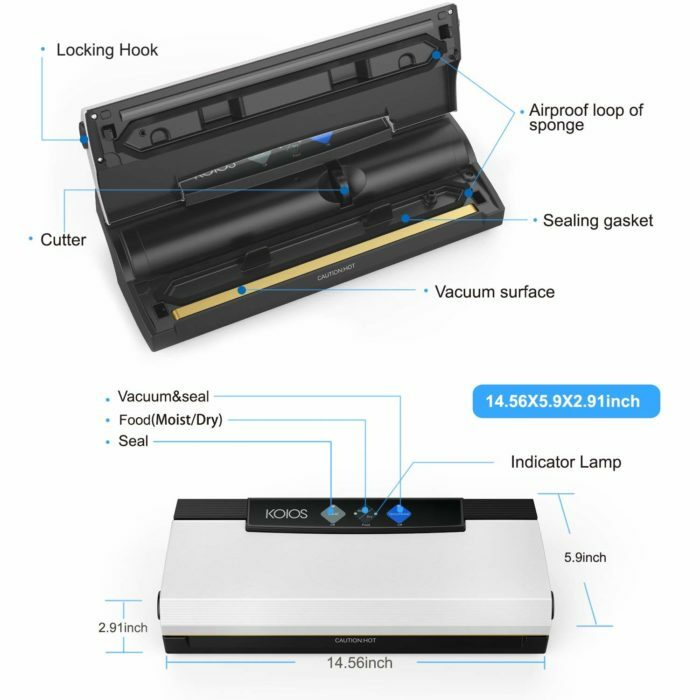 When doing vacuum seal, the machine first vacuums to air from the bag, then it switches automatically to sealing and there is an indicator light when sealing. It’s important to wait until the light goes off before pulling the bag out so bag is completely sealed. It comes with 10 precut bags of two sizes. The bags are thick enough for sou vides cooking. Never had a vacuum sealer before. Very easy to use. We don’t have to worry about freezer burn! Only used it a few times so far but its fast and does what it advertises. I am happy with my purchase. My freezer is so much more organized. Doesn’t always seal, you have to make sure you get the bag in the right spot (I am getting better the more I use it) the instructions are TERRIBLE. They were clearly translated to english so that made things a little tricky but it does work well. I have even gotten some moisture in the sealing area when I am sealing something in a marinade or that is wet and it seems to not damange the machine at all. It works well with the new rolls of bags I bought as well. I use this for freezer storage and for sous vide cooking and works great. 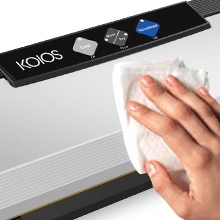 This koios sealer is just fun. I am trying to seal everything I can: meat, fruits, cereal; keeping them fresh and saving space. This product is so great for us because we usually purchase meat in bulk from Costco. Convenient, clean, and keeps meat fresh! I love it. I think it is a very product, then I really like, thank you for your product! This is exactly what I was looking for. Great product to pack my food. I would recommend it to my friend who also need vacuum sealer. I like this product very much. Its quality is very good. It makes my kitchen space look more capacious and comfortable.